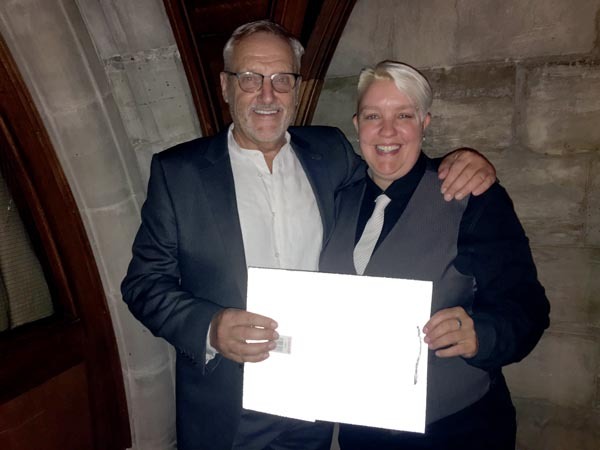 DJ Claire Fuller receives certificate from Rainbow Fund Chair, Chris Gull, after raising £300 at her Cowboys and Queens cabaret dinner and dance at the Old Ship Hotel at the end of June. The money was raised from the raffle during the dinner which was hosted by Kara Van Park. The Rainbow Fund makes grants to local LGBT+/HIV organisations who provide effective front line services to LGBT+ people in the city.